Topics: Bill Enquires, Meter Reading, Quotations, Make A Payment, Green Policies, and Services. 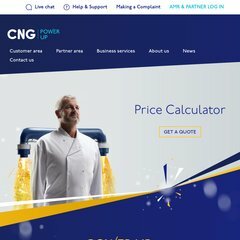 cngltd.co.uk CNG choose The Energy Event to unveil new brand : Media Centre ..
cngltd.co.uk Face to Face – Harrogate Advertiser, Business Pink : Media ..
63 users visit the site each day, each viewing 2.40 pages. It is hosted by Theplanet.com Internet Services Inc (Texas, Houston,) using Apache web server. ns21.lightning1.net, and ns20.lightning1.net are its DNS Nameservers. Cngltd.co.uk's IP address is 67.15.169.189.